For large picture click on the image. 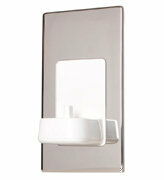 Architrave Light Switches are generally used in areas where space is restricted. 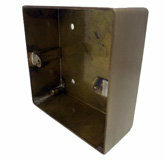 Often used in between 2 door frames or close to corners or obstructions where a standard switch simply couldn’t fit. The approximate size of 92mm x 38mm means that the architrave switch requires a specially designed wall box – these are available on our site. The superior quality Architrave range is crafted by hand in our UK factory and is one of our most discreet ranges of flat plate sockets and switches. Architrave is available in a vast verity of finishes and as such fits into almost any style of property and fits nicely with a multitude of interior design styles making Architrave one of our most versatile ranges. Finished in the following finishes, Architrave is sure to be one of our most popular ranges and is available in Polished Brass, Satin Brass, Antique Brass, Bronze and Antique Pewter or if you require a more contemporary finish we have it available in Polished Chrome, Satin Chrome, Satin Nickel, Polished Nickel, Black Nickel and a paintable Primed White finish. The Architrave plate is finished with soft rounded corners and matching metal rocker switches with a choice of Black or White trim. 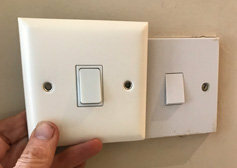 We have supplied these switches and sockets to almost every type of interior design project you can think of from the Finest Hotels, Listed Buildings, Modern Loft Apartments to Barn Conversions and smart Office Complexes. We have also supplied the contractors on the iconic Shard Skyscraper project in London with the Polished Nickel range of Architrave switches. This range includes the highest quality electrical switches on the market today, made by MK Electric these switches come with a 25 year guarantee against mechanical and electrical failure to give you the confidence that these switches will last the test of time. 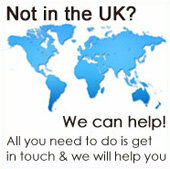 MK Electric have been delivering electrical connectivity since 1919 and are the UKs foremost manufacturer of electrical and data connectivity products and solutions. They have established a reputation for the highest standards in quality, safety and reliability. If you need a top quality product with subtle clean lines and an unobtrusively designed plate, the Architrave range of Electrical Accessories is the range for you. As you will see from the list below we offer a comprehensive range, however should you require an item not listed below please give our sales team a call on 0845 8123838 and we will check availability. See the wiring diagrams for Intermediate Switches. 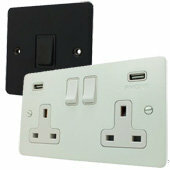 Why not have a look at the other Sockets & Switches style products?